Growing up, I had always assumed that I would have the highest degree possible. I dreamed of becoming a marine biologist, with the requisite Ph.D., of course. It was only after taking my first teaching job that the dream fizzled and died. After a year of teaching, I decided to get my master’s degree in speech pathology. This program felt doable. It would be three years long, and I could work part-time while taking classes. It was within driving distance of my apartment (although technically on the other end of the state) and reasonably priced. During grad school, I only remember meeting one person who was getting her Ph.D. I thought she was a little crazy. A Ph.D. required many additional years of full-time school, tons of research, and a dissertation. Yuck! I knew those were not things for me. I was happy with my master’s degree and moved into the working field. After a decade as a speech pathologist, I began to wonder what was next. I enjoyed my field and did not want to leave, but I did feel the urge to expand my knowledge and expertise. I made a mental note that when my children were finished with college, I would go back to school for something. Last spring, however, something in my brain strongly triggered that desire again. Although my kids were a decade from completing college, I no longer wanted to wait. I had some money in savings and the drive to move forward. I knew that I still did not want a Ph.D. (because of the research and need to go back to school full time), but there were other doctorate degrees available. 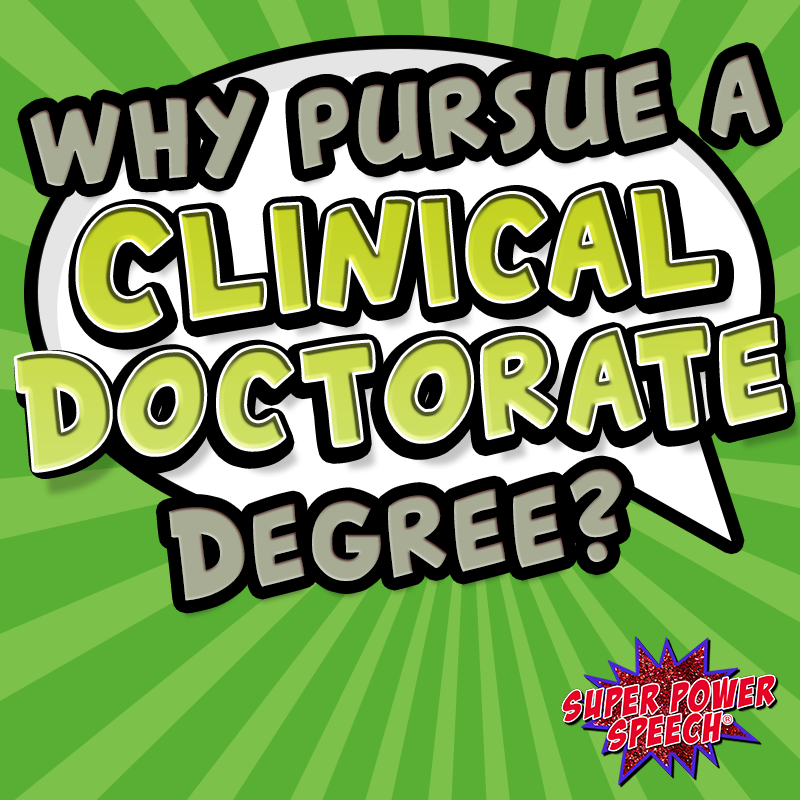 I researched both the doctorate of education (EdD) and clinical speech pathology doctorate (SLP-D). I spoke to multiple speech pathologists both currently enrolled in programs and graduates. I changed my mind every single day. Every. single. day. At last, I decided to pursue a clinical doctorate in speech pathology. I applied and was accepted into Rocky Mountain University of Health Professions (RMUoHP). The program and admissions office was so kind to me. They rushed my application through, in case I wanted to start in the summer. They offered me a housing stipend. They followed up with me. It should have been a very easy decision to accept their offer, but I kept putting it off. In my prideful heart, I wanted to get my doctorate from a program that was extremely well respected. I attended an Ivy League undergraduate program and it is one of the things about which I am most proud. I wondered if I really want a doctorate from a school I had never heard of until a few months ago? I decided to wait on accepting RMUoHP’s admission offer and apply to a prestigious school as well. And then I went on vacation with my son. While on vacation, I realized that I had the travel bug. I wanted more adventures with my family. My kids would be grown soon and we had done so little together. A doctorate at the prestigious school would be much more expensive, and there would be no possibility of traveling for years. Any extra cash that I had would go straight into tuition. So, in the middle of a Hawaiian vacation, I told my both husband and the program director that I would be enrolling as a fall student at RMUoHP. I wish I could say exactly how I came to all of my decisions. I am already in the top salary tier in my school district, so this degree will not advance my annual pay. Rather than being a financial choice, this was a heart decision. The following is a list of factors that played into my decision to pursue a clinical doctorate. Maybe these are things that you are considering as well. Everyone talks about how therapy should be evidence-based, but no one ever instructed me how. As many hours as I’ve spent trying to find the “definitive list of how to work with children with language disorders”, I just can’t find it. I wanted to be taught specifically how to make sure my therapy and my products are good practice. After 18.5 years in the field of speech pathology, I felt like I was ready for the next step. I looked into ABA programs and AT certification, but what I really wanted was classes that would push me towards a higher degree. I yearned to enrich my knowledge in the field and get credit for it in the form of a degree. One of the best things about working in the school system (besides summer break), is that you can retire quite early. In fact, I should be able to “retire” before the age of 60. That said, however, I have no intention of sitting home idly. With a doctorate degree, I hope to have increased opportunities to work at the collegiate level and present at the national level. The degree will make me more competitive for working in clinics, consulting, or health care. My current plan is to focus on alternative and augmentative communication (AAC) for my capstone project. I would like to develop a training plan and curriculum for school staff on ways to model, support, and use AAC. By completing this project, I will have an extra specialization knowledge that will hopefully serve me well in both my current and future jobs. Finally, getting a doctorate has been a bucket list dream of mine. I was so excited to find out that there are now non-PhD doctorate programs, as this was not the case when I graduated with my master’s degree in 2000. Even better, these programs allow the SLP to continue working full time. I could have waited until my children finished college, but I wanted to seize the day and begin this journey now while I am healthy and strong. So I begin my degree next week. By the time you read this post, I will likely be in the middle of the program (or possibly will have finished). Here’s to having big dreams. Here’s to education. Here’s to pursuing your dreams! Have you or are you currently getting a doctorate degree? How did you come to that decision? I would love to talk more to you by email! I have been thinking about this a lot also. Thank you for sharing this. I am anxious to hear about your journey. I have considered pursuing an additional degree a little, but now you have really sparked my interest. Good Luck. Sorry I didn’t see this message. I was not able to attend ASHA this year, but thanks for asking! Thanks for sharing, insight and info. Gives a little nudge to the thought process that someday I too could pursue that Ph.D. I too felt the need to keep learning. I went the route of Ed.D. It was a long hard three years with lots of evenings questioning my sanity and if I had made the right choice. Well, I did finish and here I am 5 years later glad I did it, but not sure what is next. Thank you so much for your post! I just finished my masters degree, literally about to start my CFY in the next week. I have been an SLPA for the last 5 years on top of attending a part time masters but I really have been wanting more such as a SLP-D or EdD. Thank you so much for sharing!!! This just gave me a little push. I have been researching and thinking about this for too long as well. Obsessing and pondering if pursuing a higher degree to do the same thing was worth all the hassle (investment, time and stress!!). Reading this post just shattered the block I had in my mind and helped me overcome the fear of doing something that might be pointless. I wish you the best of luck in this new journey and, please, keep sharing if you can. Thank you! It is wonderful to hear of another SLP pursuing an Ed.D. I’m looking into applying to the Johns Hopkins program because they have a “Teaching, Mind, and the Brain” emphasis that I’m really interested in. I can’t wait to hear your reflections on the program and your next steps – congratulations on going for your goal! When I was in grad school, I noticed that the best professors were those who had worked as “real” SLPs or who had their own private practices on the side. The ones who spent their whole careers in academia weren’t in touch with what it was like to actually do the work of an SLP. I told myself I’d like to work for 15 years, then get my PhD. Now that I’m already in year 21…it’s hard for me to think of the time and money needed to get that degree. I’m eager to see how your experience unfolds. I love learning and maybe want to follow in your footsteps! Thank you so much for sharing this information. I am currently in graduate school and have been trying to decided if I want to pursue a Clinical Doctorate in the future. I haven’t met or been able to talk to anyone pursing a Clinical Doctorate. I have looked at various programs, but would like to talk to someone who has a Clinical Doctorate or is pursing one. If you have time I would love to talk to you and hear your about experience. I wish you the best in all your endeavors. Thank you for sharing this post. It should be noted that only the Ph.D. and Ed.D. are considered terminal degrees by the ASHA CAA. This can play a big factor if somone’s goal is academia. The SLP-D has the potential to be career-limiting in the realm of academia, which some people are not aware of, unfortunately. I want to pursue a clinical doctorate degree and have wanted to do so for a year now, but I have a 10 month old and want more kids. A part of me wants to push myself to go back to school now while the academia world is still a bit fresh (3 year Slp here), but I also want time with my kids and don’t want to miss the younger years. I feel like it maybe too difficult for me to go back later though for I struggled in school all my life, but I’m not afraid to push myself in following my dreams! Thanks for paving the way and the wonderfully motivating post! Good Luck! Hello! I have been contemplating getting my clinical doctorate and I’ve been looking into RMUoHP as well as Nova Southeastern. I would love to talk with you about your experience, if you wouldn’t mind!